While in Rome, do as the Romans. It is also the best way to get under the city’s skin and enjoy the experiences in most authentic way. However, if you are in Nepal, it might get a little tricky. The country is home to over one hundred ethnic groups that have their own distinct cultures, traditions, and ways of life. It is always wise to get properly acquainted with a place and its lifestyle for a smoother experience. Being a secular country, Nepal doesn’t have any strict rule of conduct, and definitely doesn’t impose any state-made or religious rules to conduct everyday lives. That is why you can dress normally depending on your choice and weather conditions. But, if you want to dress like a local, here are some tips to do so. Kurta is a typical South Asian dress for women with long tunic top and loose-fitting pants. However, you can skip the pants for leggings, a more popular fashion choice among young Nepali women). The kurtas are available in variety of cloth material, and you can always choose one depending on the weather. It is lightweight, convenient, and very easy to carry. Other than being easily available and economic, it will also save you from unwanted glares you’ll receive when you’re dressed rather sparsely. It is tempting to forego all your makeup and small fashion luxuries when you are travelling. But mind you, Nepalese people love to dress well and always look put together. Even if they do not have to go or be anywhere, they always make a point to wear crisp, fresh clothes and sport a neatly done hair. So, if you do not want to look like yet another disheveled backpacker the city sees in abundance, make a point to look presentable, put together, and clean. Although the city is dotted with high-end malls that houses all kinds of branded stores, the markets in the inner parts of the city always sees a great influx of shoppers than these malls. Specifically, the vicinity around Kathmandu Durbar Square, which has been a bustling market for centuries, is an all-time favorite. The pro of shopping in this area is that you can buy almost anything to wear at very good bargain. This is a bonus tip, something you don’t have to necessarily follow. But, if you like to go an extra mile and literally dress like a local, for a memorable experience, go for it. 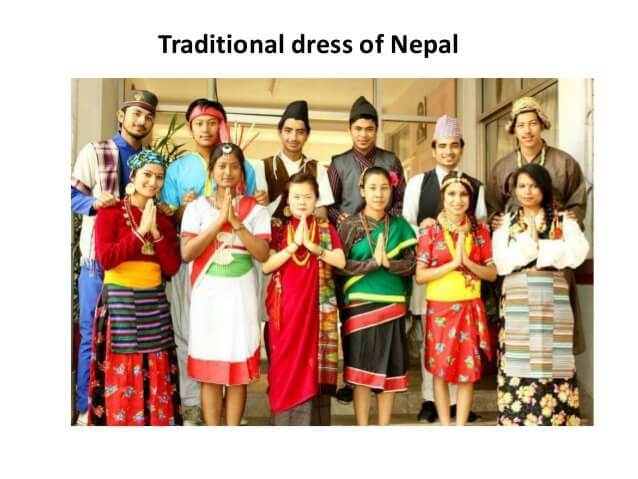 All ethnic groups in Nepal have very pretty traditional dresses with even prettier jewelries to accompany it. If you want, you can very easily rent these costumes at a nominal price. It is specially a good idea if you want to take part in any cultural event or festival, or just take a photograph for memories of your Nepal travels.